I'm popping in quickly to let you know that the Handmade with Love Super Bundle (affiliate link) is available now for a 48 hour flash sale. This bundle includes 21 ebooks, 25 patterns and 6 ecourses 😲, all for 97% off the cost of buying them separately. Topics include quilting, bag making, sewing for baby and the home, knitting, crocheting, embroidery, cross stitch and more. With Christmas fast approaching, you can be sure there's at least one perfect gift idea just waiting for you in the bundle! 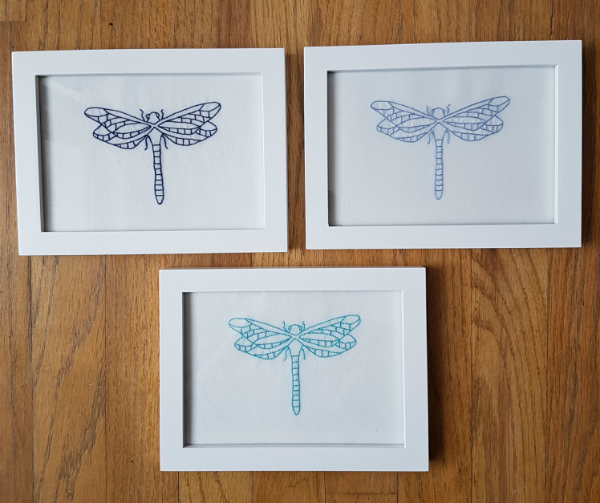 I used one of the patterns in the bundle to make these beautiful dragonfly embroideries for my mom for Christmas last year. When I bought my bundle (at a reduced price because I'm an affiliate, just to be clear), I had no intention of making Mom's gift, but I loved the dragonflies when I saw them and immediately went searching for some white fabric to stitch them onto. I think I went from buying the bundle to starting to stitch in less than an hour! The bundle also includes a 6 month subscription to Make Modern magazine (and you know I love Make Modern 😊). That subscription alone is almost the cost of the full bundle! This is the last time the bundle will be available as the folks at Ultimate Bundles will be retiring it for good after this sale, so don't wait! The sale ends Wednesday, November 14th at 11:59 pm ET. Get your copy of the Handmade with Love Super Bundle now! Note, this post contains affiliate links, which means that if you click the link and make a purchase I may receive a small commission. This does not affect the price you pay. Thank you for your support!